M&S Parking: NYPD: No, you cannot save your parking spot with a chair/ garbage can/ etc. NYPD: No, you cannot save your parking spot with a chair/ garbage can/ etc. Contrary to popular belief, you cannot save the parking spot you worked so hard to shovel out after the blizzard with a chair or garbage can. 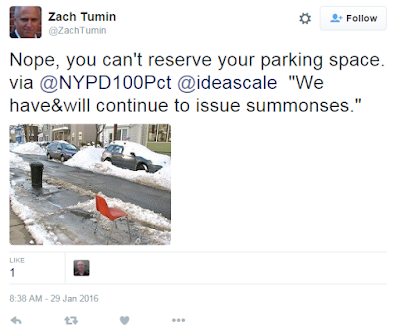 According to Zach Tumin, NYPD Deputy Commissioner of Strategic Initiatives, not only can you not reserve your parking space, but if you try to do so, you may receive a summons. Mr. Tumin's tweet comes after several days of heated debate on social media.